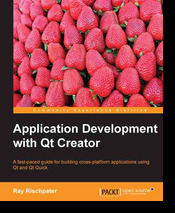 Packt sent me a copy of their new book on using Qt-Creator "Application Development with Qt-Creator" by Ray Rischpater. It is very clearly targeted at beginners and anyone with experience of other IDEs would probably find it too light. However, if you are completely new to programming it covers some of the basics of using Qt-Creator, but not really enough to create an actual application. This is not a book for learning C++ or Qt. The code samples are very simple. There is section on how to use Qt's signals and slots but many of the topics needed for non-trivial applications are not even mentioned (for example the more advanced widgets such as lists, tables, combo-boxes or event handling.) Fortunately, Qt has comprehensive documentation that covers most of this. For anyone familiar with an IDE these are all straight forward and easy to use. However, if you are new to programming (and are therefore in the target audience for this book) then you might want a bit more explanation and description of the available functions. The really big omission is a description of the location function (Ctrl+K). This function is central to using Qt-Creator and, for me, what makes Qt-Creator stand out as an IDE. The location field in the bottom left of the screen has many functions. Just typing a filename allows quick opening of any file in the project. It also gives access to the help system, the source control functions, lists of classes and member functions. Since this is something that sets Qt-Creator apart it almost deserves a whole chapter by itself, but it is not even mentioned. The lack of coverage of major functions actually suggests that the author has not actually used Qt-Creator for any serious development and has not used Qt significantly either. Slots can be private (or protected) contrary to what is claimed in the book. The overall impression is one of a professional writer who has not actually used Qt-Creator for any real development. So the writing is clear and easy to follow but the coverage of the topic is very superficial. If you just want to quickly learn how to setup Qt-Creator, for example to complete a class assignment, then this book covers what you need. For professional developers on larger projects this book is missing coverage of too many functions.